1 Preheat oven to 400 degrees F. Place sweet potatoes on a sheet pan. Drizzle 2 tablespoons of olive oil and sprinkle with cinnamon then toss potatoes until oil and cinnamon is all over. Cook in the oven for 30 minutes Turning the potatoes halfway through the cooking. 2 Meanwhile, brush 12 lamb chops with 3 tablespoons olive oil and cook on a grill at high heat for 3-4 minutes each side for medium rare. 3 Toss 2 cups watercress sprigs with 1 tbsp vinaigrette dressing and divide between 4 serving plates. Top with three pieces of lamb on each plate. 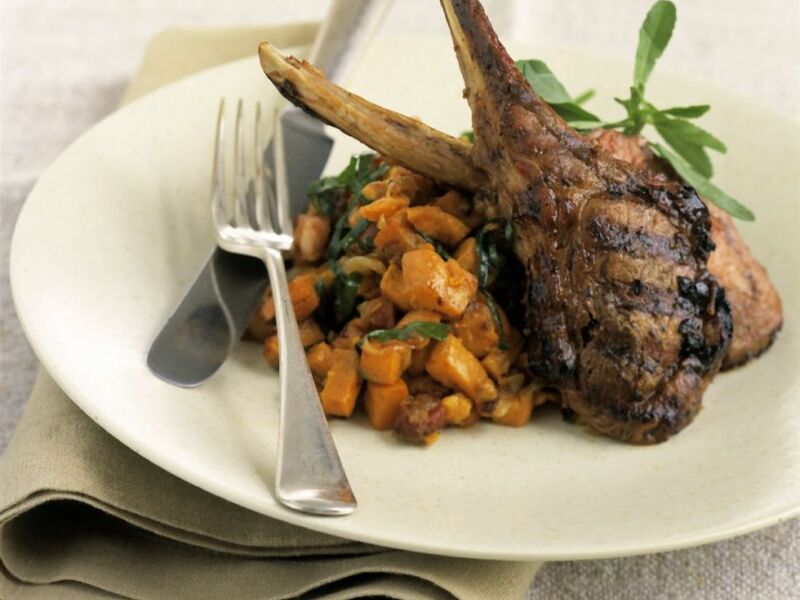 Spoon sweet potatoes to accompany the lamb.